Psychedelic Vancouver rockers Spoon River are set to release their sophomore record The New Sun Ahhhhh Hotel later this month, and to get you pumped for the forthcoming album, Exclaim.ca has your first look at the band's new video for "In the Parking Lots of the Swamp Museum." Led by Tavis Eachan Triance (formerly of the Rocky Mountain Band) and his wife Rachel Horkenheimer, Spoon River fancy themselves unconventional drifters. Their free-living approach and inability to stay in one place is reflected on the new album, which was recorded between Montreal's Breakglass Studios and Vancouver's Afterlife and Rain City studios. The band have played shows of every calibre — "opening for sword swallowers, slogging it out at veterans clubs and prairie roadhouses but also tearing it up in front of packed houses," as a recent press release puts it — but their latest single finds them "In the Parking Lots of the Swamp Museum." The accompanying visuals, directed by Horkenheimer, feature explosions of colour and kaleidoscope effects, as the band play everywhere from the pavement to the forest. 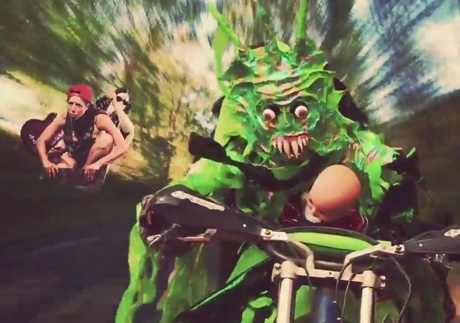 Oh, and there's a giant swamp monster that comes to life and snatches a baby, then makes his getaway on a motorcycle. Triance and Horkenheimer clamber into their flying keyboard in hot pursuit of the crazed creature and you can see how it all turns out by watching the clip below. The New Sun Ahhhhh Hotel arrives on November 18 via Tonic Records. Spoon River will play Vancouver's Rickshaw Theatre on November 21 with No Sinner and the city's Fox Theatre on December 5 with Barr Brothers. The band also plan to tour the record across Canada early next year.